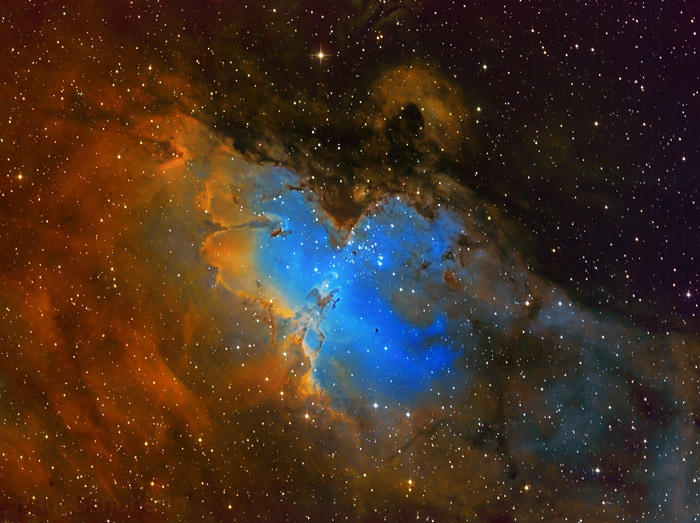 M16 Eagle Nebula – Hubble Palette (crop of center) by AstroBin user Paul Schuberth. Copyright Paul Schuberth, All Rights Reserved. Used by permission. We found out that the image was actually posted to Paul Schuberth’s AstroBin.com account. He’d taken this image from Bavaria in Germany using a fast 10″ Newtonian outfitted with our BIG Paracorr Coma Corrector — an accessory virtually mandatory for creating sharp, wide-field images with fast Newtonians. Another delightful “Hubble Palette” image he produced is this “Bubble Nebula” (NGC 7635) image taken with the same imaging setup. This emission region features a glass-like bubble formed by the shock front of stellar winds that runs into cooler, denser material in the surrounding molecular cloud. The radiation from the star in the bubble heats up the element-rich cloud and causes it to glow a bronze color in the image. The bubble is about 10-light-years across. 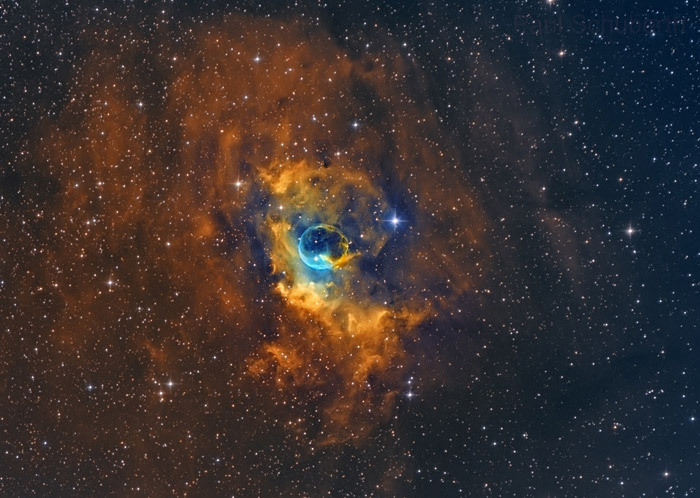 Bubble Nebula by AstroBin user Paul Schuberth. Copyright Paul Schuberth, All Rights Reserved. Used by permission. Teleskop Service TS Optics 10″ f/4.65 Newtonian-Astrograph using Tele Vue BIG Paracorr 3″ and Atik 383L+ mono camera carried on Sky-Watcher EQ8 mount. 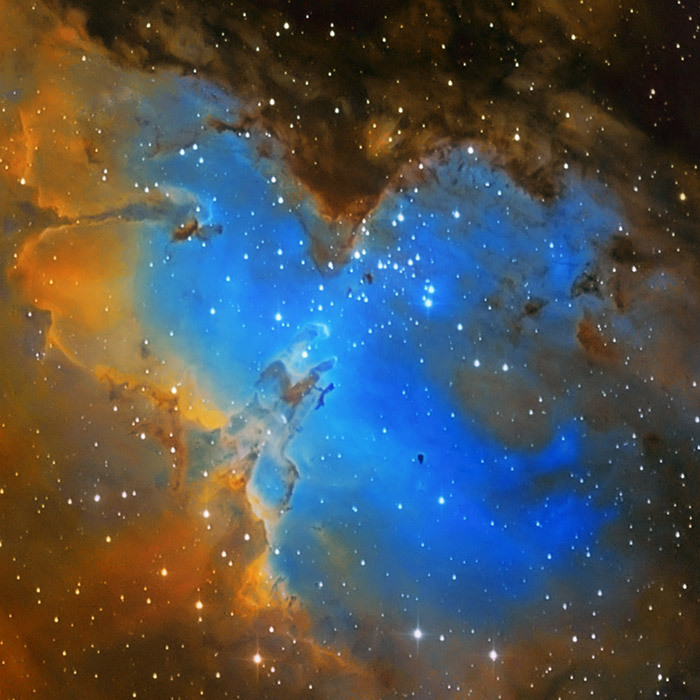 Taken in the “Hubble Palette” using Baader 36mm filters: H-alpha 7nm (12×900″), OIII 8.5nm (12×900″), and SII 8nm (12×900″) filters with a total integration time of 9-hrs. In this cropped image highlighting the “bubble,” the bright star toward the bottom of the bubble is driving the expansion. It is a young, massive (45 solar masses) O-type star that is thousands of times more luminous than our sun. It will end its life as a neutron star or black hole after undergoing a a supernova explosion. 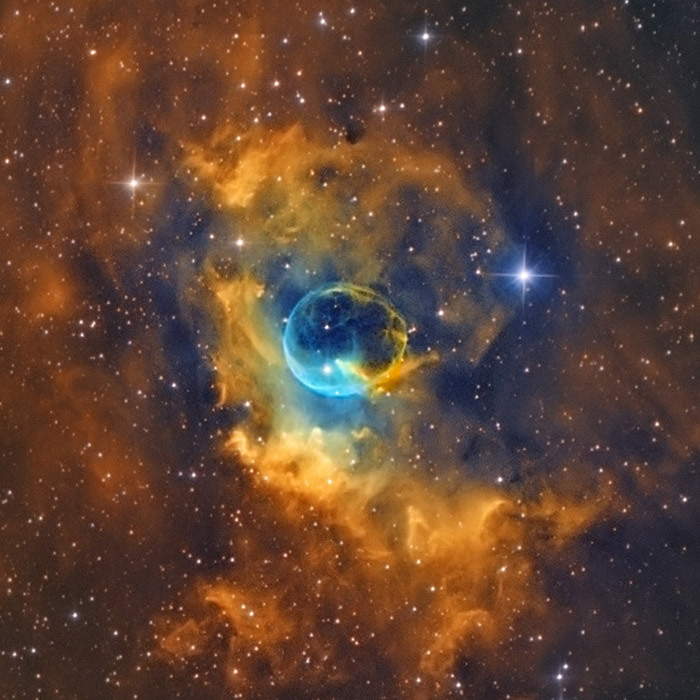 Bubble Nebula (central crop) by AstroBin user Paul Schuberth. Copyright Paul Schuberth, All Rights Reserved. Used by permission. Looking like a post-modern art painting, Paul’s Iris Nebula portrait is stunning. Named after the colorful Iris flower, light from a bright star is reflects as blue off the knotty web of dust in the cloud that surrounds it. The reddish clouds contrasting with the blue nebula are caused by glowing gas energized by the star. For this image his camera filters were used to capture the luminosity (black and white) of the object as well as red, green, and blue colors. 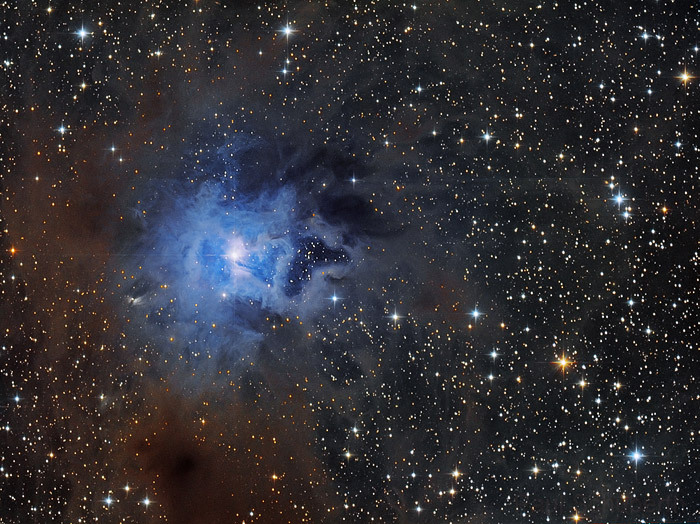 NGC 7023 Iris nebula by AstroBin user Paul Schuberth. Copyright Paul Schuberth, All Rights Reserved. Used by permission. Teleskop Service TS Optics 10″ f/4.65 Newtonian-Astrograph using Tele Vue BIG Paracorr 3″ and Atik 383L+ mono camera carried on Sky-Watcher EQ8 mount. LRGB using Baader 36mm filters (L:32×360″, RGB: 51×360″) with a total integration time of 8.3-hrs. Amazing details are shown in the palette of blues in a black sea with starry sparkles in this crop of the Iris Nebula (also known as Caldwell 4 ). 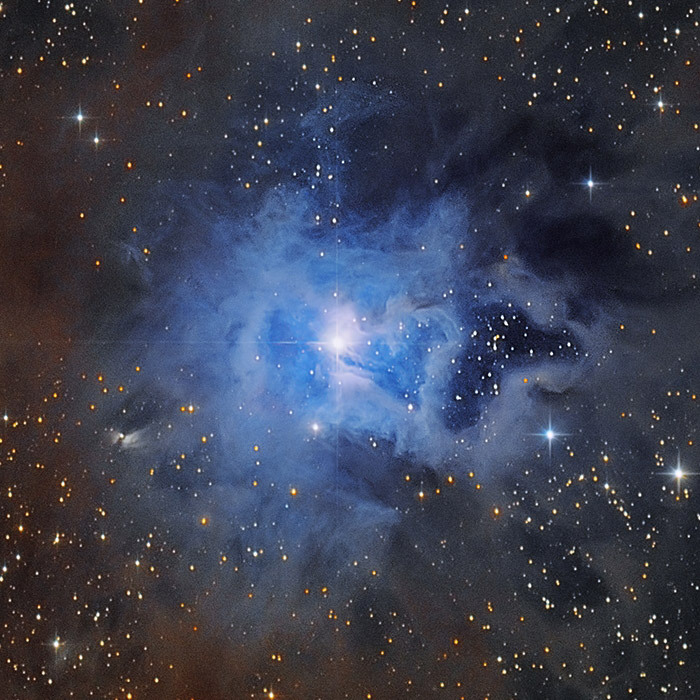 NGC 7023 Iris nebula (crop) by AstroBin user Paul Schuberth. Copyright Paul Schuberth, All Rights Reserved. Used by permission. Our BIG Paracorr Type-2 turns fast Newtonians into astrograph-quality scopes by fixing the problem inherent in all fast parabolic mirrors: coma. This off-axis aberration makes round stars look like little comets which all point to the center of the field. By making color-free coma corrections to the optics, BIG Paracorr allows a fast f/3 Newtonian’s mirror to act like a longer f/12 mirror. Stars at the edge of an f/3 mirror are 25-times smaller than if the coma was left uncorrected! For amateurs and professionals using CCD formats as large as 52-mm on the diagonal, sharp, wide-field imaging across the entire field of view becomes possible with a BIG Paracorr Type-2 on these scopes. 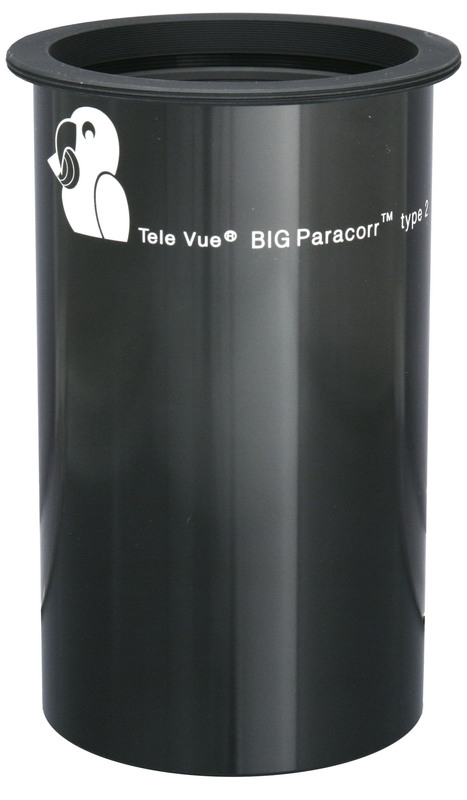 BIG Paracorr Type-2 (VIP-3010) is the 3″ version of the Paracorr designed for imaging with big camera chips. Back focal length has been extended to 80-mm to allow for additional accessories to be placed in the optical path. Ask your scope builder to include one in your next build. Because his imaging tests generated more photos than could be printed, the balance of the images, plus a description of the modifications made to the scope to mount the BIG Paracorr, were featured in a fascinating and informative “beyond the printed page” posting on the magazine’s website. Among the additional online images is an 80-min exposure of the Horsehead Nebula with the comment:”Despite the extraordinarily bright star Alnitak (Zeta Orionis) at the eastern end of Orion’s Belt, there are no objectionable halos or reflections introduced by the Paracorr optics.” You can read Tele Vue’s 3-inch Paracorr online for more information. For years, BIG Dob owners were forced to climb ladders to enjoy the deep-sky views afforded by the mega-sized mirrors in their scopes. 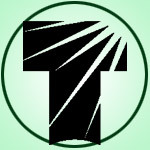 Making telescopes tubes with a more reasonable height would require faster mirrors — meaning diminished optical quality due to coma. Enter BIG Paracorr: by fixing the optical flaws inherent in faster mirrors the tube can be shorter — making large ladderless Dobsonian possible! You can read about this New Dobsonian Revolution (PDF) in an article from Astronomy magazine. Newtonians as fast as f/3 with standard 2″ focusers, can benefit by employing our 2″ Paracorr Type-2 (VIP-2010). It’s especially useful for scopes on non-tracking mounts because your object is now sharp anywhere in the field, not only in the center. This unit features a “Tunable Top” to correct coma with 1¼” or 2″ eyepieces. 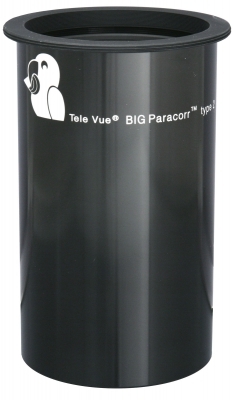 Unscrewing the Tunable Top allows this smaller Paracorr to work with Tele Vue imaging system components to permit use with SLR and CCD cameras. For imaging, APS size formats 27-mm diameter are recommended to minimize field vignetting. Previous Previous post: DeLite-full Holiday Season SALE!